This is a delicious comforting meal, full of flavour. Heat the oil in a large frying pan or wok. Tip in the eggs to coat the base of the pan. Cook for 1 min, then flip and cook the other side until set. Remove and chop into ribbons. Add curry paste and sugar and fry for 1 min. Tip in the rice and stir to coat in the paste, then add the spring onions and peas. Stir-fry for 2-3 mins until everything is really hot. Add soy sauce, then gently mix through the omelette ribbons and mackerel. Divide between 4 bowls and garnish with the cucumber. Serve with extra soy sauce. 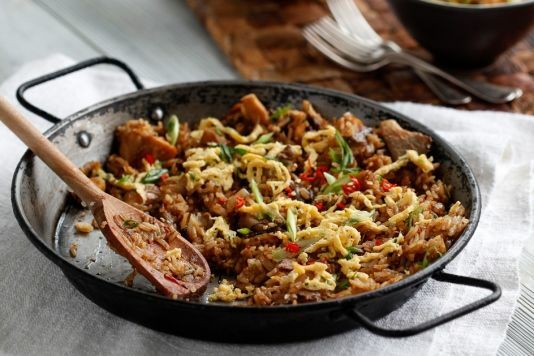 Gallery | This entry was posted in Recipes / Food and tagged Curry, Egg Fried Rice, Food, Fried Rice, Mackerel, Mackerel Fried Rice, Recipe, Rice. Bookmark the permalink.